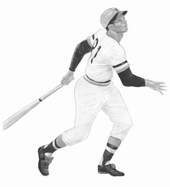 The baseball swing is individual from player to player. Some hitters stand right on top of home plate and some farther away. Feet apart or close together. Open stance, closed stance. Hands held high or low. Crouched or upright. It seems they all have their own way of getting to the ball. Yet, at the moment of contact, all great hitters are in pretty much the same position. Weight back, head down, arms extended. Driving through the baseball. Over the years I have studied major league hitters past and present. Below are my renderings of some of these famous baseball players in their batting stance, during their swing or in their follow through.